Decisive encounters (Laurent Garnier, Sven Väth) have given rhythm to Djinxx’s career like a drum kick punctuates a dancefloor bombshell. This makes sense, since last months, the southerner has scored several points on the electronic music scene thanks to unanimously acclaimed record productions. A revelation? Regarding Djinxx, who has always acted as a complex-ridden outsider, this is how it can be defined. The idea of “revelation” mirrors recognized facts: a signing on two reference labels such as F Com or Cocoon, the entreaty from Ecler a sound equipment manufacturer which called on Djinxx to represent the brand…As for the artist, he has carefully retained his prime philosophy: “ I still keep inside me this craving to learn. I think about each day as the beginning of my career”. Precociously emerged on the budding electronic music scene in the south of France, House music was Djinxx’s favourite playground in his beginning even if later he settles on a techno register: today it is easier to understand the fellow’s eclecticism. His demand for “more” leads him to multiply musical experiments and to settle in Amsterdam in 1998 then in Miami in 2000. There, he had encounters after encounters with seminal artists of the American scene at that time. Back in France, the jockey starts to work as a producer releasing a debut three-track 12” on Deep Touch. Then, various compositions lead to the release of a series of five EPs, The Unexpected on So True Recordings. In April 2003, Serial releases Time Out Gallery (rated record of the month by Roger Sanchez) while his collaboration with Néo, musician and producer, on a double EP Let’s Have a Party (a funky jazz-house crossover) is out on Black Jazz. Then, our man becomes cofounder of Mangusta, one of the labels parts of the Black Jack/Riviera universe (now Grosso Modo Production) with a few EPs heralding his debut album: Travel Notes. This LP entirely composed and arranged by Djinxx is released in June 2003. The artist in a smooth show of strength demonstrates his command on every dancefloor-oriented electronic spectrum from deep house to tech house. His singles are remixed by big guns such as Stacey Pullen or John Tejada. Yet, Djinxx already wants to move into top gear. Late 2003, the engine starts to race with New Yorker label Ündo’s entreaties. Spurred on by Laurent Garnier, always paying attention to the artist’s capacities, F… U F-Com, the impeccable electro label dancefloor-oriented subdivision releases Blue Flag in 2004. It proves to be quite a good springboard for a producer who was only waiting to be given his chance. And no one would be disappointed. During a year and half the producer would release four 12”s on this label and would establish himself as one of the most prolific and talented French dancefloor-dedicated artists. While others would have not looked beyond the rosy picture of the result, he refuses to slow down. He is chosen by Ecler to represent the latest mixing desk Sclat 200vs/6FX (Ecler is Djinxx’s favourite brand since his beginning), then in spring 2005 he creates two labels to release his new productions: The Soul Monkey and Sahkatek! 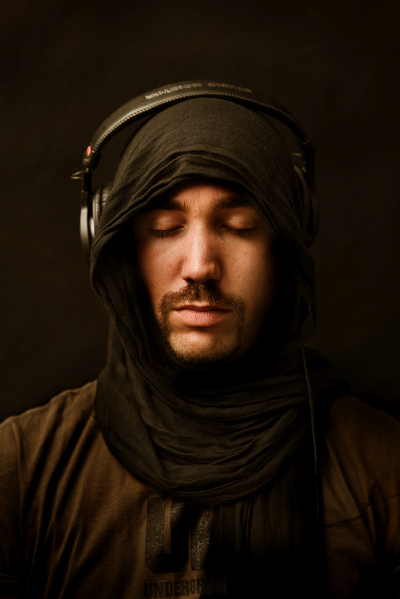 The Soul Monkey (one of his historical alias as producer) is dedicated to house music. Sahkatek (as in SAHraoui KArim TEKnology), dedicated to tech-house/techno releases, is a “collector label” whose productions will be limited to ten references. Under the disguise of Electronic Resistance, on Sahkatek, Djinxx stands up for high quality productions (Human Been and Exposure are huge dancefloor bombshells) featuring remixes from leading figures such as Deetron, John Dählback, Funk D'Void, Vince Watson, Paul Mac, Jérôme or ADNY aka Alexis Delano. At the same time, an EP on 100 % Pure (label frequented by Sterac aka Steve Rachmad or Jamie Anderson), a second one on Hypnotic (under the name of The Soul Monkey), another one on Belgian label Série (under the name of Electronic Resistance), as well as remixes from Deetron and Funk D’Void singles that will set the pace of this fertile year 2005. Yet the temporary height of this young career remains the encounter with Sven Väth in spring. The techno icon of Germany has asked him to produce an EP under Cocoon’s prestigious banner to be released in September 2005...If Djinxx contemplates each day as the beginning of his career, no wonder that today he does not have many “dreams” left: from now on, he calls them “plans”.